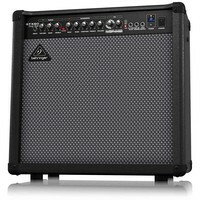 A powerful 60-Watt 2-channel guitar amplifier with authentic tube modeling featuring a digital FX processor with reverb chorus flanger and delay. This entry was posted in Behringer and tagged Guitar-and-Bass. Bookmark the permalink.